You are viewing a list of Kyra Sedgwick's 9 appearances on Brooklyn Nine-Nine. When Jake offers to drive Sergeant Jeffords to the hospital for his vasectomy, Terry tells Jake he thinks of him as "work friend" - not a friend friend. When a drugged up Terry admits he isn't sure he wants the vasectomy, Jake tries to prevent the operation. Meanwhile, Captain Holt is in a precarious position when an enemy from his past returns in a position of power. When an Internal Affairs investigator arrives at the precinct, Jake and Captain Holt work to uncover the mole in their department. Meanwhile, Terry and Rosa go undercover at a "silent disco" as part of their giggle pig drug task force, and Charles and Gina are at the center of a surprising discovery for the squad. When Jake and Charles volunteer to spend eight days on a stakeout together, their friendship is strained by living in close quarters. Meanwhile, Captain Holt's nephew, Marcus, catches the attention of Rosa. After Sophia thinks her and Jake's jobs make a relationship unworkable, Jake tries to patch things up by befriending Sophia's boss, Geoffrey Hoytsman. 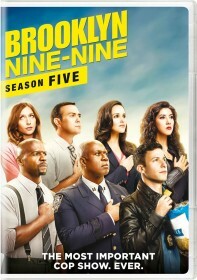 Meanwhile, Deputy Chief Wuntch is dependent on Captain Holt for a job recommendation, and Amy helps smooth things over between Gina and Boyle who quarrel over their parents' affair. Captain Holt pairs Jake and Amy up to catch a notorious identity thief. Things take an intimate turn when Jake and Amy go undercover as Johnny and Dora, a newly engaged couple. Meanwhile, the whole precinct is shocked by the news that somebody is leaving the Nine-Nine.